Declaring his goal of making Detroit “the car capital of the world again,” President Donald Trump visited the Motor City on Wednesday bearing what could be a major gift for the domestic carmakers — but one that quickly raised concerns among environmentalists. Trump said he was ordering the EPA to reopen a mid-term review of Corporate Average Fuel Economy, or CAFE, standards that would require the industry to deliver a fleet average of at least 54.5 mpg by 2025. Many — though not all — manufacturers have warned they cannot meet that target without raising vehicle prices beyond what consumers could afford, something Ford CEO Mark Fields in January told the president could cost 1 million automotive jobs. The announcement that the government would review both the mileage target and timing was actually less of a radical development than many had expected, with some industry observers questioning whether the new administration might slash the numbers immediately or, perhaps, repeal CAFE entirely as part of Trump’s promise to reduce government regulations. Such moves might yet happen, environmentalists fear, especially with the recent confirmation of Scott Pruitt, a long-time agency critic, as head of the EPA. Another prospect is that the administration may revoke the waiver that allows California to set its own emissions standards. The state has used that rule to demand automakers start rolling out large numbers of zero-emissions vehicles, such as the hydrogen-powered models from Honda, Toyota and Hyundai, as well as battery cars like the Tesla Model S and Chevrolet Bolt EV. A dozen states have now copied the California mandate. CAFE dates back to the 1970s, when Congress decided to force the industry to reduce dependence upon foreign oil in the wake of the first Mideast oil embargo. The 2025 target was set as part of a compromise reached between the Obama Administration and the auto industry. But in recent years, as oil prices have plunged, and Americans have shifted from small, fuel-efficient sedans to big SUVs and pickups, that has complicated the effort of meeting the 54.5 mpg target. The mandate called for a mid-term review to see if the goal remained feasible. Despite strong industry demands for relief, the EPA sided with environmentalists, issuing what Trump decried as an “11th hour” ruling ordering the mileage mandate to stand just days before Obama left office. 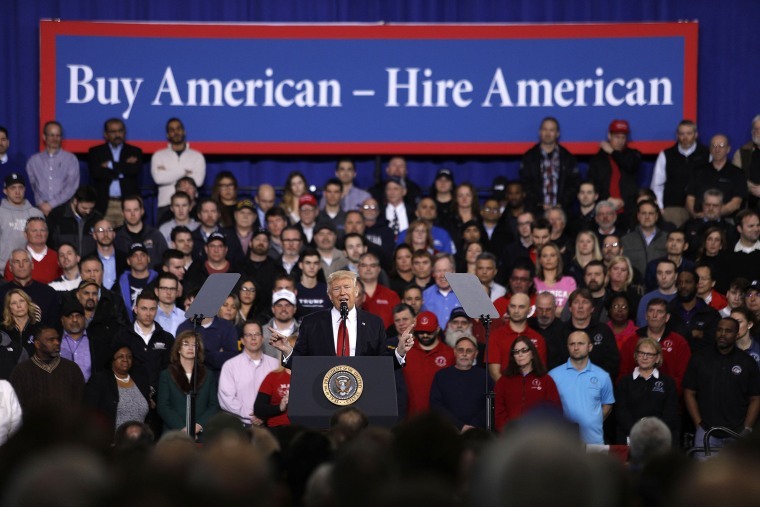 The new president positioned his decision along the lines outlined by Ford CEO Fields, arguing that, “This is going to be a new era for American jobs and job creation,” during a media roundtable. The visit to Michigan was held at the site of the old B24 bomber plant from World War II in the Detroit suburb of Ypsilanti. It is now being converted to a test track for the development of autonomous vehicles. Not surprisingly, automakers praised the Wednesday announcement, though the president’s action also was roundly condemned by those who said it would condemn Americans to deal with dirtier air, a warming global climate and be a boondoggle for energy companies. California Governor Jerry Brown called the move “an unconscionable gift for polluters,” adding that his state will launch a lawsuit, along with New York, challenging the re-opening of the review. “If they succeed, we’ll pay more at the pump, depend more on oil from bad countries, drive up the trade deficit and pollute our kids,” said Dan Becker, director of the Safe Climate Campaign. Ordering the mid-term review reopened, a final decision might not be made until as late as April of 2018. That raises the question of how the auto industry will respond. Key planning moves, particular when it comes to investments on advanced powertrains and other key, energy saving technologies, must be made years in advance, and several industry officials said they’ve already begun laying out strategies, and making preliminary investments, reaching out to 2025. They may be reluctant to now hold back on the assumption of a CAFE rollback by the Trump Administration, especially if that were to face a credible legal challenge. At the worst for environmentalists, automakers might decide to cut some of their zero-emission and alternative energy programs. At a more benign level, observers suggested, the industry might simply use a cut in the 54.5 mpg target to increase their mix of less efficient light trucks. In recent months, General Motors CEO Mary Barra has said the automaker “remains committed” to adding more plug-in hybrids and battery-electric vehicles, such as the Chevrolet Volt and the Chevy Bolt EV. Foreign-based makers seem even more determined to stay the course with high-efficiency gasoline and alternative-power vehicles. “No matter what happens in the U.S., we will not change any of our plans for electrified vehicles and more efficient vehicles,” Nissan CEO Carlos Ghosn declared during a news conference at the Geneva Motor Show last week. Honda is just launching its new Clarity FCV, a hydrogen fuel-cell vehicle, and its global CEO recently reaffirmed plans to have fully half of the company’s products powered either by batteries or hydrogen by 2025. Center said Honda isn’t entirely pleased with strict mandates, like CAFE, in part because “No government can regulate what people buy.” And so, as the current surge of demand for pickups and SUVs demonstrates, it can become more difficult to meet mandates while also giving consumers the products they want. While automakers like Nissan, Honda and Toyota are expected to continue introducing more green vehicles, industry analysts say they may still wind up lowering their own corporate mileage targets by increasing production of their own light truck models — such as the Nissan Murano SUV, the new midsize Honda Ridgeline pickup and the full-size Toyota Tundra pickup. One reason why all makers, Detroit, European or Asian, may find it difficult to make major shifts in their strategies is the fact that they all operate on a global scale. With a few exceptions, notably their big pickups, automakers design their vehicles to be sold around the world. And so, said Nissan’s Ghosn, even if the U.S. rolls back CAFE, the likelihood is for even tougher emissions standards in other key markets, such as Europe, Japan and China. “We’re going to have to keep an eye” on those rules, and develop vehicles accordingly, he said, no matter what happens in the U.S.